I’ve been practicing yoga for 5 years now, starting seriously with a couple years of regular Bikram practice, then switching to do a meddley of ashtanga and Iyengar and Hatha yoga. Then I discovered AcroYoga. Though I practice yoga regularly I’ve never really been part of the community, so it was actually through work that I ended up going the The Yoga Show last year (thanks to Paul of Yogamatters for the ticket!). 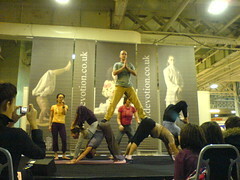 There I saw a demo by the London AcroYoga team and I walked away thinking “I am going to try that!”. A little later than than I’d have hoped, due to a strained tendon and some time away, I attended my first AcroYoga workshop (every 3rd Sunday of the month at Globe House near London Bridge). There has been no looking back. AcroYoga is a combination of acrobatics, yoga and Thai massage. You don’t really need experience in any of the above, but it will help. It shouldn’t replace your yoga practice (I still practice ashtanga/hatha at home) but it compliments it nicely. AcroYoga is different to yoga because you work in pairs or in larger groups, so it is requires you to put your trust and confidence in – and have fun working with – others. What has really amazed me is how much you can achieve, even when you are new to the game. The teachers are constantly demonstrating a formation which I look at and think “yeah, right!” and 10mins later, with the careful and attentive assistance of a spotter, I’m in the middle of basing or flying it. For that reason it is incredibly rewarding and very addictive! Doing AcroYoga regularly will build up your core body strength, as well as strengthening your arms and legs. I come away from the classes feeling exhilarated. The video below is a beautiful demonstration of AcroYoga and one which proves that it doesn’t matter how big or small you are – you only need to build up the strength and confidence to be able play. wow! i can’t believe that this is you in that photo em! nice one! you look strong.